There are distinctively preppy cars, clothes, and hobbies. Is there such as thing as 'preppy music,' and if so, what is it? On a wholly separate topic, you have told us a little about your taste for British television and about some of your favorite books, but how about music? Beyond the Prelude to Bach's Cello Suite 1 in G, is there an artist, genre, etc. that is, IYO, quintessentially preppy? What does TDP's playlist look like? This is, of course, very complicated. First, it may not even be "playlistable". Preppy music may in part be defined by the attributes of: high quality, live, intimate, shared across generations, and ideally played in venues that don't involve tickets. Hymns cross a range, from piano to organ to a cappella, from professional to amateur, and from formal events to more casual gatherings. Hymns were undoubtedly a context in the life of so many role models of prep in the last century and earlier. Many to this day include snippets of hymns in email signatures. One sailor signs off with "Oh, hear us when we cry to Thee, For those in peril on the sea!" Still, this answer, while very left-brain for most, may not be emotionally satisfying, and even too Calvinistic on its own. Given that, what might be other examples of preppy music? I love this - which I saw as I was about to listen to my father's very old Whiffenpoof album from his college days. I agree about Cole Porter. I also think that the classic R&B songs are preppy music. The book "Tipsy in Madras" includes a playlist. I have to admit, I made that playlist on my ipod. It is awesome. Of course, I did feel the need to add "Wooly Bully". I agree with Cole Porter and would add Swing music--love those Glenn Miller, Tommy Dorsey, Benny Goodman tunes! Also, anything by Ella Fitzgerald and Duke Ellington. Having nothing to do with the readers' questions posted here, I have one question I'd like to ask you about. I have been a big fan of ralph lauren, brooks brothers, and barbour, which I bought only when huge sales go on. Recently I feel interested in ll bean since I now have hard time getting good old classic clothes from ralph lauren and brooks; not many options for barbour here in Kentucky. Although many people question about ll bean quality and sizing issues, is there any item you would recommend me or worth trying from ll bean, please? I'll defer to my own blog I have posted about preppy music , racing vintage sportscars, and classic cars which I feel I know a bit about having been in the vintage racing business and owning more classic ars than i car to mention. Musical choices are tough , there are so many , but I have listed quite a few on the Tartan terrier blog . as always you have great posts! I might add The Kingston Trio. My friend's mom taught a group of us to dance to their songs during the summer at the lake. Simon & Garfunkel have to be the soundtrack to prep. A cappella is preppy. 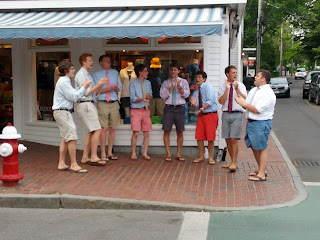 Here at the boarding school where I teach, we have a cappella groups from Princeton, Yale, and Middlebury stop in to perform almost yearly, always in blue blazers, and always to a good audience of enthusiastic students. The show "Glee" (though I haven't seen it) has only made a cappella more popular; we have both a boys' and a girls' a cappella group now, and the auditions attract a good turnout. My grandparents were perhaps the preppiest people who ever lived. Things that today we call "preppy" were for them just "normal life": Bean, sailboats, coastal Maine, St. Grottlesex, Bermuda, etc. They listened mostly to classical music. I remember they had a record called "The Age of Elegance," which they listened to a lot. It was a compilation of works by Boccherini, Handel, Hayden, Mozart, Beethoven, and others. They also listened to big band music, mostly Glen Miller and Benny Goodman. My grandmother was also a gifted pianist, and she liked to improvise on tunes by Porter, Gershwin, Kern, Berlin, and other standards from the "American songbook." So, to me, preppy music is: 1) 18th century classical, 2) big bands, and 3) American standards. I love classic jazz. Would it be considered preppy? Like Miles Davis, Thelonious (sp?) Monk, Wes Montgomery, Ornette Colman, Nancy Sinatra, Dusty Springfield, Nancy Wilson, etc. When I was a kid it seems the preps were listening to OMD, Simple Minds, Bananarama, the Go-Gos and Duran- Duran. LOL. For not so serious music, i love the 40s. For long drives, cocktail parties, informal get-togethers, etc., they have such a range and positive, mellifluous energy that captures a time and culture that, I think, conjures up classic, American values nicely. I think the Beach Boys would be one of the preppiest pop groups, also the Beatles. Unfortunately also a lot of European techno-dance music. There seems to be an assumption on this blog, which gets so many things right, that preps are a bunch of intellectuals and culture mavens. Nothing could be further from the truth; both types are very un-prepppy. It is un-preppy to be too serious. I agree with Muffy's answer about preppy music, as well as some of the comments from the readers. My opinion is that while all of those are good examples of "preppy music," they are not exclusively "preppy," and there is also a lot of newer music popular among the prep set, which is also popular elsewhere. I'd say two common threads among much prep music are education and timelessness. The music may be unique to a given institution, and/or require a good music education to be best appreciated or performed. Or, the music is of a quality that it is enduring (and, perhaps, unique to an institution) and appreciated by many generations. I strongly agree that a capella is preppy! I also always associate jazz with preppies... I went to an elite New England private college, but did not go to prep school. The kids I knew who had attended prep school (that is, more than half my class) almost all had well-developed knowledge and appreciation of music, and in many cases, the ability to perform it on one or more instruments. Many of those students, as 18-year-olds, had the in-depth knowledge of all different types of jazz which most adults never attain. Of course the same could be said of their knowledge of other musical genres, but jazz sticks out in my mind. My first college boyfriend who had attended the same prep school from K-12 taught me a lot about jazz. I also really have to add, in response to Matt's comment... I think it's hard to gauge what is quintessentially "preppy" by what one's grandparents listened to, no matter how preppy they were. My grandparents on my mother's side were the biggest WASPs you can imagine, but they were also born in the early 1920s. They were preppy, but also to a great extent products of their time. It's hard to say that their musical choices were "preppy," rather than just what was popular or well-known at the time... and at the time, even non-privileged people knew about and appreciated music in a way most people don't these days. People learned instruments, and people's main options for entertainment were live performances or the radio. For a wedding/beach/road trip soundtrack I would also add Sinatra-esque standards, @Linda's 40's (dead on accurate), Citizen Cope, Seu Jorge, Van Morrison, and Miles Davis -- and old Jimmy Buffett as a guilty pleasure. And Muffy: thanks for your posts and your attention to your readers; to use a hackneyed but apropos phrase, you are a class act. I definitely agree about hymns/acapella! I think Vampire Weekend is pretty preppy, with songs like "Cape Cod Kwassa Kwassa" and "Oxford Comma." Their album "Contra" also featured a girl in an RL polo. I would suggest that preppy music (like preppy anything) has certain flare and style, yet is non-demonstrative and abhors pretense. It is casual yet quality-focused. It is authentic, with a nod to its utilitarian roots. I'm sure there are examples of this in most music genres. BRINGS BACK GREAT MEMORIES. MUSIC MAY HAVE AN AGE CENTRIC BASIS. THE MUSIC THAT WAS A PART OF OUR MEMORY AT A CERTAIN POINT IN LIFE OFTEN STAYS WITH US. IT HAS ALL BEEN CITED ABOVE. THE BOBBY SHORT REFERENCE BRINGS TO MIND THAT AN ULTIMATE PREP EXPERIENCE WAS TO HEAR HIM IN THE SMALL, INTIMATE GATHERING AT THE CARLYLE HOTEL. ANOTHER ULTIMATE PREP GROUP THAT IS CLASSIC IS THE FOUR FRESHMEN, FORMED IN 1948 BY DON AND ROSS BARBOUR. DISCOVERED BY STAN KENTON IN DAYTON. IF YOU MISSED THEM, CHECK THEM OUT ON YOU TUBE. BEST KNOWN RENDITION IS "IT'S A BLUE WORLD". ALL AVAILABLE AT AMAZON, IF YOU LIKE IT. IMO, THESE GUYS ARE THE ULTIMATE PREP EXPERIENCE, ONCE YOU DISCOVER THEM, REGARDLESS OF YOUR GENERATION. Muffy -- to your point about hymns -- the opening of Whit Stillman's "Metropolitan" begins with the opening verse of "A Mighty Fortress is Our God." I agree with the comments about Bobby Short. My wife took me to the Carlyle for my birthday in the late 1990s. Wonderful experience. In my freshman year of college I met a sophomore who had a record playing on his stereo with the sweetest, purest voice. It was Ella Fitzgerald singing the Cole Porter Songbook. I bought the album and spent the next summer memorizing all of the lyrics. Music is such a matter of personal taste and, to a certain extent, age that maybe there isn't any music that is quintessentially "preppy". The Whiffenpoofs come up a number of times here, but that is a Yale thing. A Capella generally is in the race here, but that category incorporates barbershop quartets too (fun, but preppy?). Perhaps what is preppy about music, if anything, is entirely contextual. One of my playlists is titled "Sailing" and it is made up of Windom Hill, CSN and Jimmy Buffet (and NOT C. Cross) - all songs that remind me of sailing. The tunes themselves are not preppy but what they evoke certainly is quintessentially preppy. I appreciated the discussion of hymns, a favorite category of mine as well. "Come Thou Fount of Every Blessing" is one I hum whenever I need a lift or, yes, during an awkward silence in a conversation! The closest to quintessential preppy could be anything composed by Bach - the previously mentioned cello suite, the Goldberg variations, the Brandenburgs. A Bach piece (Concerto for Harpsichord in D Minor) is what that quintessential preppy, WFB Jr., perform in his benefit harpsichord concerts. "Ah, Bach"
I went to college (circa late 80s) with a lot of prep school kids from the East coast. The biggest difference between them and those of us from sturdy Midwestern stock was their affinity for the Grateful Dead. I would hazard a guess that 90% of the prep school guys and girls that I knew were Deadheads of varying degrees of committment. While few high school or college students are going to put hymns on their playlist, I would say that so many from preppy cultures can sing dozens if not hundreds by the time they reach their early 20's, and will further advocate the inclusion of hymns in the organizations they support for themselves and their own children decades later. Agree on the Talking Heads! And not just because my cousins went to prep school with Tina Weymouth and Chris Frantz's kids. Sartre - Bob Weir often performed in Izod shirts, back in the day. Now, he appears to be channeling his inner Jerry. No one has said Jerusalem? That said, I have a vague impression that I'm the only English person here. I love that you talked about hymns! Unfortunately few prep school have daily chapel any more. It was wonderful 'back in the day' to get together with the entire upper and middle schools to sing a hymn, say a prayer, hear an announcement, or perhaps enjoy a special program. We felt like a unit. The hymns we sang were beautiful and artful and enlarged our small world. Thanks you, Muffy. What a very odd question. I went to public school and therefore don't really identify as a preppy. But I'm guessing that English classical music might satisfy the Anglophiliac streak so many Northeasterners possess--Vaughan Williams, Elgar, Holst, Britten, Delius, Walton, Parry, etc. Add to that traditional Americans--Copland, Thompson, Ives, Barber, Gershwin. My prep-school cousins, on the other hand, grew up listening to classic rock and top-40 hits--things one can kind of groove to without listening too closely while one works on the boat. I don't think a particular taste in music is something one should--or even can--slavishly adopt. Listen to the best of what you enjoy. Learn to appreciate it. Don't limit yourself to one or two genres. The people I respect the most--many of them with New England pedigrees--have wide, eclectic, and, above all, informed tastes that encompass everything from 12th-century plainsong to bluegrass to Pink Floyd to Robert Plant. But the old hymns are indeed beautiful and evocative. Vaughan Williams did a gorgeously simple setting of "He that is down," by the way, in his opera "The Pilgrim's Progress." I always associate Bossa Nova with the best East Coast parties. I still have a ton of them that my aunts put together on a reel-to-reel decades ago. I'll burn a CD of them and send it your way. It goes very well with ice being shaken into gin and boisterous anecdotes. A little further south, many would argue that Beach Music such as that by the Catalinas, the Embers, the Tams, Chairmen of the Board, Tavares and the Spinners and others was as preppy as it got. There wasn't a party at Virginia, Washington & Lee and Sweet Briar without it. To HJ: If by "Jerusalem," you mean the Anglican hymn of the same name, a rousing rendition of which can light a fire in practically anyone's hair, I heartily second the motion. My favorite is the Emerson, Lake & Palmer recording of same; in fact, just about anything by E,L & P or Jethro Tull especially, should go near the top of the list! 1962 - 1972; Southeast USA undisputed prep schools UVa, Sewanee, W&L, Chapel Hill, UGa, UFl, without question Levi Stubbs/Four Tops ruled. If you were there, if you were wearing John Meyer [of Norwich] "sweater and skirt" with Villager blouse and Weejuns, then you know it's true. Many of the previously mentioned are on my cocktail party play list, but I also feature many songs by Xavier Cugat! I'd simply argue that a prep should have some sort of appreciation for classical music and its close relatives (which essentially amount to cultural capital), and beyond that, whatever the heck they feel like. There are stoner preps, punk preps, artsy preps, folky preps, and facetiously gangsta preps...and even if these are phases, there is always a place in one's heart for music that was once dear, no matter how tasteless or unadvisable it might have been at the time. Preppy music consisted of my own school extracurriculars of Glee Club and Choir. We had Chapel with its Hymnal full of songs: "Battle Hymn of the Republic" was given great gusto by one of my teachers from Tennessee, and the several English expat faculty were roused with "O God, Our Help In Ages Past." We boys, nonetheless, thrilled to sing John Monsell's "On Our Way Rejoicing" because it was used for Friday Chapel before the monthly Long Weekend when we were able to leave for our homes. We particularly liked to give a "fortissimo" ring to the words "as we homeward move." It is my opinion that the smaller prep schools founded under the auspices of churches or religious organizations have more enduring musical traditions than the larger corporate schools which are sometimes little different from the better public schools. I would provide examples but for giving offense to some readers who may be graduates of schools on both sides of this hypothetical and biased fence. At least during my own college years in Boston I found several friends who came from just such schools- we seemed to gravitate to one another despite geographic and other distances. My own school was founded on Christian religious ethics (just like certain small East Coast prep schools) though wisely without partisanship to a particular denomination (and my schoolmates covered all faiths from Christian to Islamic to Buddhist to Judaic to none). Our founder even built the Chapel himself with student assistance in the adobe style of the California missions, and daily Chapel with its old-fashioned hymns accompanied by organ, piano, or chorus was mandatory. My school has grown in size, and Chapel is no longer as it was. Times do change, though it is perhaps revealing that this change was overseen by a Head of Schools who came from one of those East Coast large corporate schools. I myself enjoy a lovely memory of Choir and Glee Club, orchestra and wind ensemble, and organ and piano during high school...on my way rejoicing! Nothing, nothing, nothing is better than A Welsh Lullaby (Suo Gan) at a Christmas service. Muffy, huge fan of your friend Lee Roy Reams. Those impromptu performances are the best! In New York, much of the 'hip' music of the 1950’s clubs started 20 years earlier in the Broadway pit orchestra of the Gershwin musical, "Girl Crazy," where the band included Benny Goodman (21 years old), Jimmy Dorsey (26 years old), Gene Krupa (21 years old) and Glenn Miller (26 years old). A-One, A-Two, A-One, Two, Three! I agree about the hymns. Would you permit me a bit of stream of consciousness? BTW, did you know that there is a little-known, but quite beautiful Titanic Memorial in Washington, DC? Wow where do I begin! Classical it has to be Handel & Bach! Always looked forward to the old William F. Buckley's PBS show "Point Counter Point" with the Bach Brandenburg Concerto #2 in F Allegro Assai. When comes to New England preppy music one artist always comes to mind is James Taylor! His family always summered on MV. Now Southern preps that I've known who love to dance, prefered the old R&B sounds of Carolina Beach Music! P.S. All time favorite hymn if you remember the movie "Chariots of Fire" Parry's hymn " Jerusalem"! No one has mentioned Gilbert & Sullivan. A major omission. p,s. forgot.....Christmas hymns....and Suo Gan (Charlotte Church almost sounds like the kid from Empire Of The Sun when she sings it) and Candlelight Carol. Also, Christmas Revels. Dear Muffy, Thanks so much for your wonderful blog, which I appreciate greatly. Having just finished reading Ivy Style, the authors make a connection between Ivy League style clothing of the fifties and sixties with Blue Note jazz. Just a thought... Personally, I love the stirring 18th century hymns. They had a passion to them, which for me, the modern hymns lack (too happy-clappy or nice, but dull). I attend an Anglican church (in England) with a traditional, yet varied music programme. Interesting discussion board. LBF, I suppose categorically excluding such genres (and I suppose you would also strike off gospel and blues?) from one's musical interests might be technically correct with regard to one's class and heritage, but it would prevent one from becoming a true citizen of the world. many years? PERFECTLY beautiful. Thank you. @ Beth thanks one of my all time favs! Look into anything John Rutter has done! There are some beautiful songs in the wedding ceremony of William & Kate check iTunes! "Old Blue Eyes"...The Chairman of the Board, Mr. Frank Sinatra and his Preppy anthem: "Summer Wind"! Our your choice of Mr. Sinatra's songbook of hits. Also let's not forget Mr. Peter Duchin and his orchestra! Who played at many NYC formal Prep soriees over the years. Oh boy. You might have to bring this one back up and around again. You say prep music, but I can see broad daylight between the planks of NE Very Exclusive Old School Probably-legacied Educational Institution Wasp Prep, and those of Mid-Atlantic Cultivated Wasp Prep, and those of Put Out to Board Wasp Prep with Attending Tinges of anger and rage toward the victimizing Parents, and those of High Church Wasp For Its Own Exclusive Sake Without Much thought of Christ, oh so many categories, so many, each with a different musical backdrop. Take hymns. Hymns fit snugly into a narrow exclusive frame, one had to attend a near-convent style prep school as I did to even "get" the hymns allusion, complete with mandatory chapel, mandatory vespers, mandatory recitation obligations/responsibilities, mandatory choir/madrigal/acolyte participation, heck there's no escaping the back-then-rigors that may manifest later in life as proud, blind allegiance. But I do find any connection between Sublime Exclusive Christian-style-education High Wasp and plain ole Prep to be excruciatingly strained. Do come back on this later, it's a great topic that [to me] opens up layers and layers of social strata, each with its own musical background. This is a really fun conversation. I completely agree that Vampire Weekend is a popular preppy band. I also think that listening to Paul Simon is preppy. If you go to a classical music show, you find classy people. I think that preppy kids and their parents can be found at some classical music events. Preppy kids are supposed to learn how to play classical music. There are artsy preps that can be found listening to indie rock and classic rock. Preps listen to pop music and rock music. They can be found at festivals and shows for fun...but don't mess with Vampire Weekend! "Jerusalem" is my husband's favorite; he's not a preppy by strict definition, but he instinctively leans toward tasteful classic clothing and other preppy pursuits. I think it's hard to define a favorite style of music for any single group, but something tells me rap is most definitely not preppy. Chairmen of the Board's "Give Me Just a Little More Time" - brings back many memories from college days in the Carolinas! Coming into this particular party a little late, but have been enjoying the blog tremendously. My parents got me started listening to classical music from a pretty early age, and I gravitated toward Chopin, probably because my grandmother could play some of his work on her piano. Preppy days began at the McCallie School in the fall of 1987 and I discovered Led Zeppelin, The Beatles, The Who, and early REM. A friend was borderline obsessive about what we would now call classic rock, which threw Jimi Hendrix and Them featuring Van Morrison into the mix. Maybe there is something about living in the South that made a band like Guadalcanal Diary popular in the prep and college town circles at that time, with a mix of twangy Rickenbacker guitars and lyrics involving history and religious mysticism. It is almost impossible for me to hear their music without thinking back to those times, the last couple of years at McCallie, and first year or two at the University of Tennessee at Chattanooga. Perhaps it is un-prep to say so, but the hair bands such as Poison and Motley Crue served as the soundtrack to more than a few escapades back in those days as well. I will be 40 on my next birthday, and a song can still take me back so far, back to a time of living for Friday night, school dances and frat parties, a mixtape on a road trip, and the notion that friendships would never end. I might have known! The subject of preppy music that I mentioned recently has been covered already. I am surprised (and pleased) and the broad tastes expressed here, though mine runs off in other directions. I love contemporary German pop and Schlager, for instance, as well as Swiss yodeling but I also like tango and all the old stuff I heard in college. You know, the songs you used to know the words to because the radio played them ten times a day. My tastes broadened after leaving school, though I never got to visit any of what used to be legendary venues like the Hungry I or the Bohemian Caverns. I did see a wonderful performance about 35 years ago that was a tribute to a local DJ Felix Grant. Several jazz groups performed. Hymn-wise, there are several I like and I especially enjoy certain music of the mass, although I find plainsong a little difficult, especially when sung at a Sunday night service without music. From a theological standpoint, though not so much from a musical standpoint, I like "To be a pilgrim." As Peter Schickele says, "If it sounds good, it is good." I even met him once backstage at a P.D.Q. Bach concert. Has everyone forgotten Tom Rush, graduate of Groton, Harvard and more importantly, Club 47? If indeed your memory is not as sharp as it used to be, much like mine, I invite you to hear this amusing song written and performed by the great bard himself. I promise you won’t regret it. Squeeze - quintessential British pop / new wave band. The 80's version of the Beatles in some ways. 10,000 Maniacs - they just sounded preppy. REM - very popular among preps. Dave Matthews Band - arising out of Charlottesville, VA - now broadly popular and still popular among the prep set. I would also second the Grateful Dead. They have always had a strong following among preps and the college crowd. One of their more notable concerts was at the Yale Bowl in 1971. Bob Weir wearing a polo shirt seemed to be a nod to preps. Once you get past the typical GD stereotyping, their music really embodies Americana. They are not always my taste, but I understand the appeal. In terms of current music, give a listen to Richard Hawley. He is fantastic. As in all things, "prep" music is not ostentatious, but should have a ideal mixture of classiness, erudition and fun. I think it is easier to say what's not prep in terms of music than what is. As I've got older, my tastes have grown more eclectic. I listen to classical, jazz, and rock, often on the same day. Most of the members actually met each other at some kind of prep school. The lead singer Julian Casablancas and guitar player Albert Hammond Jr. met at Institut Le Rosey in Switzerland. The same school that former Choate School Headmaster Seymour St. John attended for a year when he was sixteen years young: http://thenews.choate.edu/article/headmaster-seymour-st-john-passes-away . It does not get more preppy and elite than Le Rosey in my opinion. And The Strokes are listened to by younger preppies. My younger sister is a big fan. Another band that is listened to by many younger preppies, especially in Europe is Coldplay from England. Lead singer Chris Martin is married to American actress Gwyneth Paltrow. My grand parents, that were European country preps, mostly listened to classical music i.e. Chopin etc. Another preppy musical tradition in continental Europe is to watch the annual Vienna New Year's Concert on the TV on New Year's Day morning. It always features compositions by the Strauss family. German aristocrats, which are often preppies, listen to Richard Wagner. The Richard Wagner Bayreuth Festival is probably one of the most prestigious high society events in Europe. German Chancellor Angela Merkel attends every year. Songs like ''Sweet Caroline'', especially since the title is inspired by Caroline Kennedy, and ''America'' are New England Prep to me; as I understand it and as have learned about it here on The Daily Prep. Another ''preppy'' band, both in musical style and origin, is Arcade Fire https://en.wikipedia.org/wiki/Arcade_Fire . The two founding members, Win Butler and Josh Deu, actually first met each other at Exeter. I have listened to Arcade Fire since 2004 when their album ''Funeral'' was first released, while I lived in Munich, Germany, but I was not aware that the band had such a close connection to New England. I always associated them mainly with Montreal, Canada, where they were founded.